Seat pain is one of the major causes for leaving the bike. It can be really frustrating to have a great workout just to be soared in the wrong places the next day. Even the professional riders recommend using some kind of cushion (even a pillow!) to avoid pain after long runs. Avoid the pain, focus on your workout or your ride. 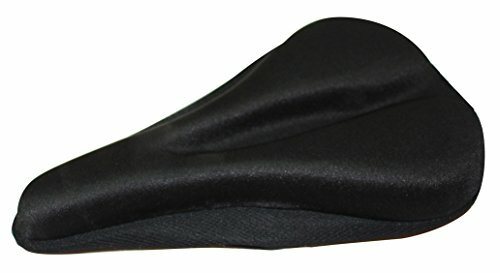 This premium gel seat cover will have your back, it doesn't matter if you ride indoors or outdoors, spining bike or mountain bike. The soft gel combined with durable materials and construction will get you wanting for another ride tomorrow. About Nujee: A young bicycle equipment company focusing mainly on delivering the best quality accessories for novice to professional riders at the best prices. ✔ FORGIVE ABOUT RAIDING PAIN OR NEXT DAY PAIN: Working out should be a pleasure, don't worry about next day pain with this comfortable gel bike seat cover. ✔ PREMIUM QUALITY: The cover is built using the best quality materials with soft gel and premium fabric to ensure comfort and durability. It will resist hard use for spin classes, outdoor biking, mountain biking. ✔ 100% MONEY-BACK GUARANTEE: The quality of the product is great, the manufacturer offer a 100% no questions asked guarantee. If you don't like the product for any reason just send back to Amazon. ✔ RIDE AGAIN: Get back on your bike! Order now, this is the best quality seat you will find at the best price. If you have any questions about this product by Nujee, contact us by completing and submitting the form below. If you are looking for a specif part number, please include it with your message.